Yesterday morning, a fit of coughing drove me out of bed at a quarter to six. It’s amazing what you can get done when the kids are still asleep, and when you’re driven by otherwise-boredom. I’ve updated the translation of the 1836 banquet, to include pages 34, 35 and most of 36 (the first part of Berthier’s speech). I’ll not reproduce it all here. Instead I’m going to start unpacking some things that I’ve found interesting. Starting with where the Banquets took place. 1836 is the last year to meet at the ‘Great restaurant in the Place du Châtelet’ named as ‘le Veau qui Tette’ [The suckling calf] – from 1837, they moved on to Ladmiral’s in the Rue Sainte Marguerite, in Saint German. 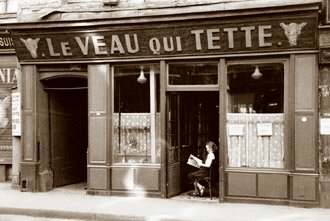 Let’s see where the Veau qui Tette is in Paris, and what it looks like now. A bit of historical detective work. Take a look at this, (or see a bigger version). 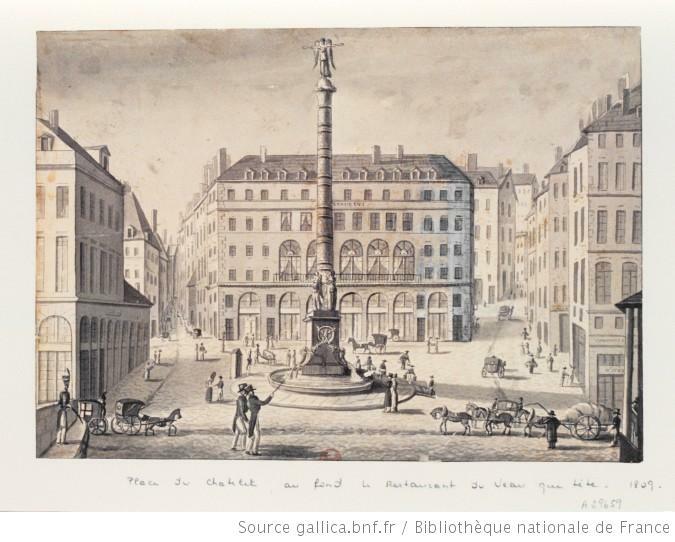 This is the Place du Châtelet in 1809, with the ‘Veau qui Tette restaurant at the back, behind the fountain. Now, go to Google maps, and type in ‘Place du Châtelet, Paris, France’. Now – and this is the clever bit – use Google street view to look at the square from all sides. Can you work out which building was the ‘Veau qui Tette’? I think I can – and here are a few clues. Look at the direction of the winged figure on the top of the fountain. Assuming that it’s not been rotated (and I can’t believe it has, although the bottom has been changed over time), then the building you want is directly behind the figure. Look also at the location of the river. In the 1809 image, the artist appears to be standing on a bridge – and in the modern view, you can clearly find the edge of the square that is boundaried by the river. OK, the building appears to bear no resemblance to the image above… and there are two other present-day buildings on the square that match nearly exactly to the lower floors of the architecture of the image above. But take a look at the other pictures of it at the Paris Pittoresque site (where I got these) and you’ll see a variety of images from different dates. You’ll also find – if you can pick through a translation (or read the French) that the restaurant evolved from a butchers, to a ‘taverne’, and moved a number of times over its history, to end up butted up against the Châtelet prison, where its roof served as a jumping point for escaping inmates. So, it’s not really entirely certain yet where the 1834,5 or 6 banquets were actually held. But if I had to commit, I’d say the restaurant sat in a much more built up (at the time) site where the ‘Centre des Notaires’ now sits, on the Avenue Victoria, on the North side of the square. I find it fascinating to be able to look at the actual site where the early banquet events took place and to imagine the November arrival of dozens of Deaf men. Did they mill about in the square before and watch boys playing boats on the fountain (see the image above close up)… Did they huddle in quickly to escape from the icy Seine blast? I only wish I’d visited it when I was in Paris myself. 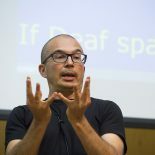 I have always been captivated by the Deaf-Mute Banquets in Paris and have used these events to motivate students to study the history of the Deaf Community. I too have visited Paris and had the opportunity to visit St Jacques. To walk on the worn steps of hundreds of Deaf students was amazing and to see some of the achived materails was indeed an experience to remember! It’s amazing isn’t it – to be able to actually stand where things happened. My favourite place was Sicard’s office at the Rue St Jacques school… to imagine him there, and Bébian, and Clerc, and Berthier, and Paulmier, and the others… brilliant! This entry was posted on January 24, 2013 by Mike Gulliver in DEAF, DEAF history, Musings and tagged detective, google maps, history, le veau qui tette, street view..